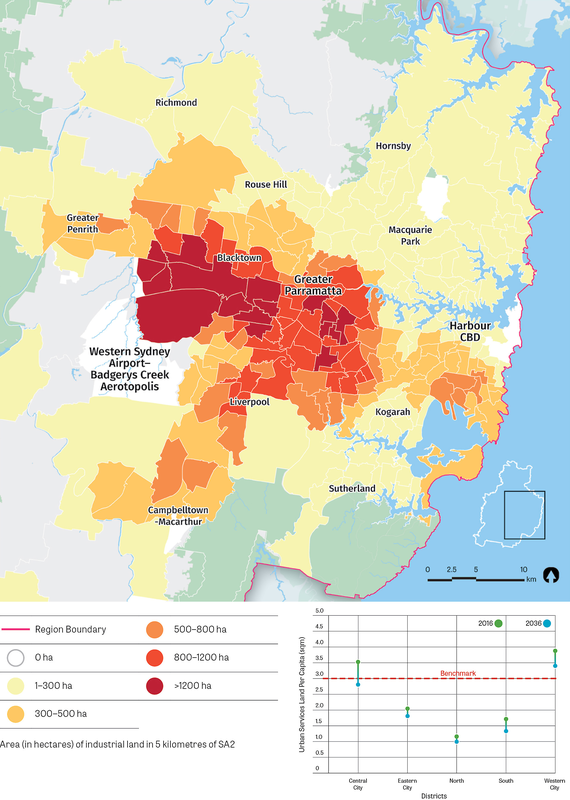 Much of Greater Sydney’s manufacturing wealth is created on industrial and urban services land and 74 per cent of these lands are in the Central City and Western City Districts. Across Greater Sydney, 15 per cent of all jobs are on industrial and urban services land41, yet only eight per cent of developable land in Greater Sydney does not permit residential uses. Industrial and urban services land refers to land identified in the NSW Department of Planning and Environment’s Employment Lands Development Monitor42, and includes industrial zoned land and some business zoned land which permits a number of industrial uses. This land can include a range of activities from major freight and logistics and heavy manufacturing to light industry, urban services and new economy or creative uses. The role, location and infrastructure requirements of each activity type are described in Table 5. The demand for industrial and urban services land across Greater Sydney is driven by these different locational needs and infrastructure requirements. Major manufacturing and production, major freight and logistics, warehousing and regional distribution. Service metropolitan or larger areas. Large precinct and large lot sizes. Close to critical infrastructure, including motorways, arterial roads, the freight rail network, intermodal terminals, ports and airports. Separated from residential uses, typically on the urban fringe, near to trade gateways. Light manufacturing Light, generally small scale, manufacturing of goods. Mixed lot sizes depending on the sizes and needs of the business. Urban Services Industries that enable the city to develop and its businesses and residents to operate. Support the activities of local populations and businesses. Include concrete batching, waste recycling and transfer, printing, motor vehicle repairs, construction depots, and utilities (electricity, water, gas supply). Dispersed across Greater Sydney on varied sized lots. Close to surrounding residential and commercial centres they directly serve. Rely on proximity to markets. Light industry Wide range of business that service other business and populations. Include warehousing, freight and logistics, construction and building supplies, and domestic storage. Close to surrounding residential and commercial community they directly serve. Mixed light industry, new economy or creative uses. Low impact uses with a combination of industrial and commercial functions. Include new economy uses (e.g. artisan industries such as furniture making, upholstery, niche manufacturing) and creative uses. One or a small number of purpose-built factory buildings. Typically surrounded by residential uses with some access to public transport. Industrial and urban services wholesale Low to medium scale buildings supplying industrial and urban services businesses with hardware, building materials, and related resources. Close to surrounding businesses they serve. The NSW Department of Planning and Environment monitors changes in industrial land supply and annually publishes its findings in the Employment Lands Development Monitor. A summary of the existing supply of developed and undeveloped industrial land across Greater Sydney showing the main activities in each district is outlined in Table 6. While the table shows 3,033 hectares as being undeveloped, not all this land is currently serviced with water and lead-in sewer infrastructure, which creates a risk in delivering and maintaining a competitive industrial market. The servicing of existing and new land zoned for industrial and urban services is therefore a priority to support the continued growth of the economy and local jobs. The range of activities in industrial precincts varies considerably. As Greater Sydney grows and the demand for land increases, improving the understanding of the type of activities occurring in industrial and business zones is important to enable the most effective land use policies. Objective 40 includes an action to respond to this issue which involves more detailed monitoring and reporting of the demand for and delivery of industrial and urban services land across Greater Sydney. The term ‘urban services’ is used to describe a wide range of industries that locate in cities. Urban services include a collection of industries that enable the city to develop and its businesses and residents to operate. While they are not always high employers, on a square kilometre basis, their value is not held in how many jobs they directly provide, but in the operational role and function they play throughout the city. Urban services tend to have particular land use, floor space, operational or accessibility characteristics that require them to locate in non-residential areas. Industrial zoned land and certain commercial zones (for example, B5 – Business Development or B7 – Business Parks) provide for these uses. The property economics behind these zones are also a core attribute which allow urban services to locate close to markets in line with their operational needs and therefore supply the higher order economic activities of the city. If uncertainty is created, in terms of rezoning potential, speculation will impact on the property economics of the industrial zones resulting, potentially, in the loss of these important services. They also safeguard against land use conflict with non-compatible uses, such as residential use. 1,244 3,412 4,656 Manufacturing is by far the most dominant non-urban services industry, with Wholesale Trade second, although with far less prevalence. 39 1,458 1,497 Manufacturing and Retail Trade are the dominant industries, followed by Professional and Scientific Services, other Wholesale Trade and Health Care. 39 533 572 All industrial profiles are evenly distributed throughout the District, due to the lack of major precincts. 140 1,526 1,666 Manufacturing dominates the District’s urban services precinct with a relatively even distribution of other industries. 1,571 3,865 5,436 Urban services followed by Manufacturing and Health Care and Social Assistance. Other industries are relatively evenly distributed. Source: NSW Department of Planning and Environment, Employment Lands Development Monitor, includes industrial zones and some B5, B6 and B7 zones as per the Employment Lands Development Monitor definition. Manufacturing, freight and logistics businesses are often flexible regarding their preferred location, and are influenced by the availability of large, lower-priced sites with very good access to transport networks, specifically motorways, major arterial roads, the freight rail network, intermodal terminals, ports and airports. Therefore, they are often located on the fringe of cities and around trade gateways. Urban services often serve local communities and businesses, therefore they locate close to their markets, including residential areas and commercial centres. The provision of services and jobs close to business and where people live are considered critical to Greater Sydney’s productivity. In the past, substantial tracts of industrial land in the Eastern Harbour City were converted to mixed-use residential zones, in response to unprecedented demand for residential supply. There is now considered to be a shortage of industrial and urban services land in the Eastern Harbour City. Safeguarding industries from encroachment from sensitive uses. Approaches, including buffers, can protect the operations of various industries (including concrete batching plants, waste handling facilities, freight activities) and should not be compromised by encroachment from sensitive land uses like residential, which are impacted by noise, light and odours. These tensions between uses have the potential to restrict the operation of existing industrial and urban services activities and thus have a negative impact on the productivity of Greater Sydney (refer to Objective 16). Maintaining a sufficient supply of land. High land values have been found to negatively impact on the amount of land per capita occupied by urban services. Therefore, there is a need to provide a sufficient supply of industrial and urban services land and have a consistent policy position to keep downward pressure on land values. A review of industrial land adjacent to train stations, which would normally be considered a preferred location for conversion to residential development, reveals there are only a few sites remaining across Greater Sydney. Further, this industrial land adjacent to train stations is, in the main, part of large intact industrial precincts or directly linked to the freight rail network and therefore highly valuable industrial land – it is not suitable for conversion to residential. In the Eastern Harbour City, there are many smaller industrial precincts which have a higher than average proportion of urban services activities. 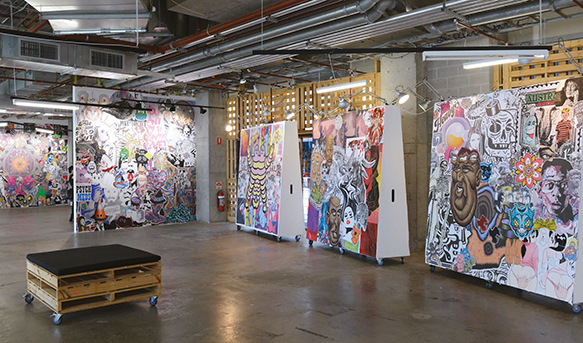 Therefore, while they may appear to be only a small part of the industrial land supply, they are important for providing urban services and, in some cases, creative industries. In land release areas, there is a need to consider the likely long-term population of the area and future wider employment activities, and therefore the need to develop land for local industrial and urban services. In these locations, it is often the lack of trunk infrastructure supporting industrial and urban services sites that limits timely development and land supply. The Western Sydney Employment Area, in the Western Parkland City, is a Greater Sydney resource providing land for economic activities and employment for the region as a whole. Strategic plans have identified over 6,000 hectares of additional land for future industrial activity yet to be zoned or serviced, which will support the investment and business opportunities created by the Western Sydney Airport and the potential transport infrastructure identified for the Western Parkland City. This significant long-term metropolitan resource, while substantial, may not serve the local urban services needs of the Western Parkland City which stretches across a 54 kilometre corridor from Wilton to Marsden Park. The adaptation of buildings to accommodate high-bay automation requires building heights greater than existing buildings and current planning limits. Increased building heights are needed for the evolution of buildings in areas such as the Central River City, that have logistics functions linked to freight infrastructure networks. Manufacturing techniques are changing rapidly in response to technological and digital improvements creating new business models and advanced manufacturing. These changes may require a review of planning regulations which may be placing unnecessary barriers to the growth of advanced manufacturing43. Changes are occurring in the freight and logistics sector, in part driven by technology changes and related changes to some retail business models. While there is significant long-term growth in the freight and logistics sector in the Western Parkland City, the nature of different supplies such as local produce, will require opportunities in the Central River City and Eastern Harbour City to be retained. The currency and comprehensiveness of council studies and strategies that inform industrial and urban services land policy and planning controls varies by council. Research prepared for the Greater Sydney Commission, informed by an analysis of industrial lands in the Australian Capital Territory, identified a benchmark requirement of three square metres of industrial land per capita for urban services activities44. The current and projected per capita levels for each Greater Sydney district are shown in the graph on Figure 41. The per capita level of provision in the Eastern Harbour City is already well below three square metres per capita. While the Western Parkland City will benefit from the Western Sydney Employment Area, there may be a need to provide additional industrial and urban services areas across the extensive footprint of the Western City to accommodate significant population growth beyond 2036. While the Central River City currently exceeds this minimum benchmark, it too will experience significant population growth and these lands represent notable opportunities to transition to higher order employment, technology and advanced manufacturing uses. Source: Derived from the New South Wales Department of Planning and Environment land use zones as at January 2018. Retain and manage: All existing industrial and urban services land should be safeguarded from competing pressures, especially residential and mixed-use zones. This approach retains this land for economic activities required for Greater Sydney’s operation, such as urban services. Specifically these industrial lands are required for economic and employment purposes. Therefore the number of jobs should not be the primary objective – rather a mix of economic outcomes that support the city and population. The management of these lands should accommodate evolving business practices and changes in needs for urban services from the surrounding community and businesses. There will be a need, from time to time, to review the list of appropriate activities within any precinct in consideration of evolving business practices and how they can be supported through permitted uses in local environmental plans. Any review should take into consideration findings of industrial, commercial and centre strategies for the local government area and/or the district. The retain and manage approach applies across the Eastern Harbour City, the North West Growth Area and industrial land in the established urban areas of the Western Parkland City, including the existing Western Sydney Employment Area. Review and manage: The Greater Sydney Commission will review all industrial and urban services land under this approach to either confirm its retention (as described in the approach above) or manage uses to allow sites to transition to higher-order employment activities (such as business parks) and seek appropriate controls to maximise business and employment outcomes. The review will consider the current level of industrial and urban services land supply, the changing nature of industries and the transformation in the sector impacting on changing demands for land. In limited cases, conversion to other uses may be appropriate. Equally in some locations such as GPOP, specifically Camellia, Rydalmere and Silverwater, the retention of industrial activities will be a starting objective. The Greater Sydney Commission will collaborate with State agencies and councils and seek input from stakeholders as part of the review. The review and manage approach applies across the established areas of Central City District, Hornsby, Liverpool and Fairfield. Plan and manage: In land release areas, there is a need for additional industrial and urban services land in response to long-term projected population and development growth. The Greater Sydney Commission will work with the NSW Department of Planning and Environment, other State agencies, including Transport for New South Wales, and councils as strategic plans are prepared to determine additional industrial and urban services land requirements. Additional industrial and urban services land needs to be accompanied by timely sequencing and servicing of infrastructure. 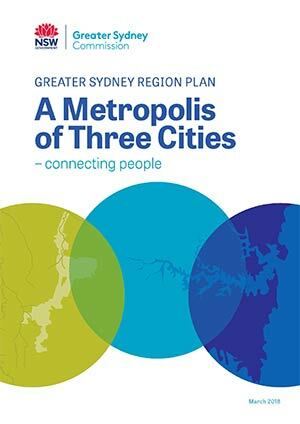 The plan and manage approach applies across the South West and Western Sydney Airport Growth Areas. Councils will be required to undertake a strategic review of industrial and employment activities across their council area as part of their review of their local environmental plan, to be approved by the Greater Sydney Commission. The Greater Sydney Commission will monitor the performance of the principles to manage industrial and urban services land, including a formal review every five years. Retaining local jobs for local communities of Metropolitan Rural Areas is an important outcome. The management of industrial and urban services land requires ongoing monitoring of changing industry needs, trends and new technologies. From time to time, controls may need to be reviewed to support the evolution of economic functions on industrial and urban services land and the diversity of activities within precincts. Retain, review and plan industrial and urban services land in accordance with the principles for managing industrial and urban services land. There is a need to grow and diversify local employment opportunities. A total of nine locations across Greater Sydney account for approximately 75 per cent of standalone commercial office precincts, located in the Central City, Eastern City and North Districts. 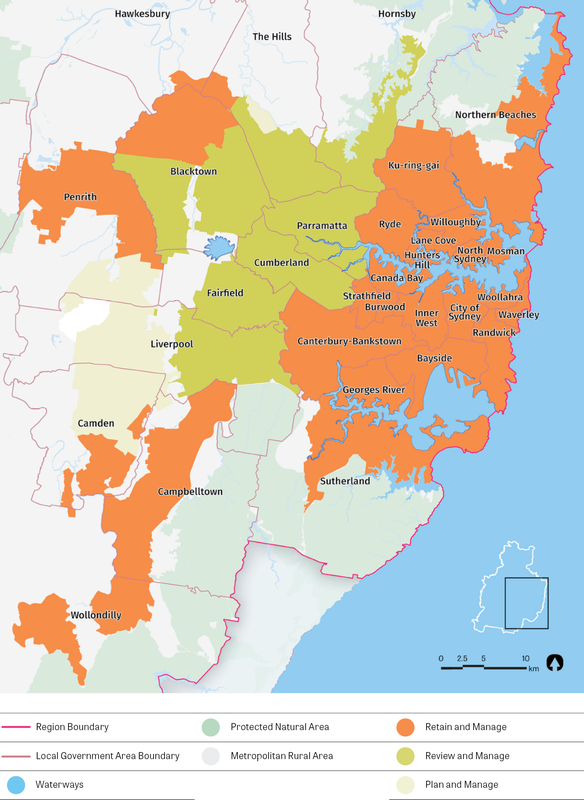 The majority of biotechnology and pharmaceutical clusters are also located in these three districts (refer to Objective 21) further empahsising the north-easterly bias in the location of Greater Sydney's knowledge businesses. In the South District and Western City District, there are no major standalone office precincts, increasing the need for residents to travel long distances to access a broad range of job opportunities. Innovative approaches in the South and Western City Districts may present opportunities where office uses can be compatible on certain industrial and urban services land. This could facilitate the attraction of knowledge businesses and a broader diversity of jobs close to home. In parts of Greater Sydney such as Lane Cove West, Mascot, Camperdown and Warriewood, office, industrial and urban services activities have been able to co-locate successfully. These precincts offer a broad range of urban services and jobs to the surrounding community. Delivering on this objective should not compromise the operations of existing and planned industrial activities, or compromise Objective 22: Investment and business activity in centres. The Greater Sydney Commission will work with councils and the NSW Department of Planning and Environment to develop the required statutory tools. Consider office development in industrial zones where it does not compromise industrial or urban services activities in the South and Western City Districts. The Greater Sydney Commission to review all industrial and urban services land identified as review and manage in close collaboration with State agencies, councils and with industry input. The review will confirm retention of industrial and urban services land and in limited cases its transition to other uses. The Greater Sydney Commission will work with the NSW Department of Planning and Environment to review the industrial and urban services land in the South West and Western Sydney Airport Growth Areas to determine if additional lands are required to meet long term population and employment growth.